NEW YORK - Dec. 18, 2017 - PRLog -- New Flight Charters, a nationwide leader in private jet charter since 2004, announces the largest public listing of empty legs in the jet charter industry. The company now is listing over 150 upcoming and available empty legs from U.S. private charter aircraft. Also known as dead-heads or ferry flights, empty legs are flights without passengers on board when an aircraft needs to be moved. Often a private charter jet will have empty leg flights associated with an existing flight schedule- when it needs to move to another location to start a charter, or return back to base after completing a charter, or the same situations for its owner flights. These empty legs, when an aircraft needs to fly a certain direction, can be a unique opportunity for a low-cost jet charter. Aircraft can be re-routed to accommodate a charter flight need. For example, an empty leg from Houston to Denver can be rerouted for a Dallas to Aspen charter at a much lower than normal cost. Rates can vary since each empty leg charter is unique, but pricing is typically 30-50% lower than standard charter quotes. "When an empty leg matches up with a flight need, there is no better value in private flying," commented Rick Colson, New Fight Charters' president. "Working with the largest charter availability in the industry we use a variety of tools to source ideal aircraft options for any given charter request." Floating Fleets are a second attractive and lower cost solution. A fast-growing option in private jet charter is utilizing a non-based Floating Fleet aircraft for better one-way pricing, point-to-point. These can be available in all parts of the U.S., for all types of flying, from shorter one-hour flights to coast-to-coast and international flights. Floating Fleet aircraft do not have to return to a base, and thus can be more cost-effective charter options. 334 floating fleet jets are available nationwide through New Flight Charters; all sizes from light jets to ultra long-range jets such as the Global 5000. Charter quotes for these floating fleet aircraft are typically 15-30% less than traditional based aircraft. Any requested charter need can be fully customized for aircraft, size, type, and amenities along with desired ratings or registrations from ARGUSÒ, Wyvern Ltd.Ò, IS-BAO or the Air Charter Safety Foundation. Since 2004 charter aircraft owner and leading U.S. private jet charter brokerage New Flight Charters has arranged private domestic and international flights with top-rated operator aircraft along with its jet charter pricing Best Price Guarantee, top aircraft availability, industry empty legs list, and a perfect safety history. As a registered U.S. government contractor with an A+ rating by the BBB, and named to the Inc.500 fastest growing list four consecutive years, the jet charter company handles 1,400 flights annually nationwide and serves a wide variety of clientele including Fortune 500 companies, government heads of state, presidential campaigns, entertainment icons, private families and entrepreneurs. Extensive client reviews and industry ratings are available on the New Flight Charters website. For charter quotes or information nationwide, call (800) 732-1653. 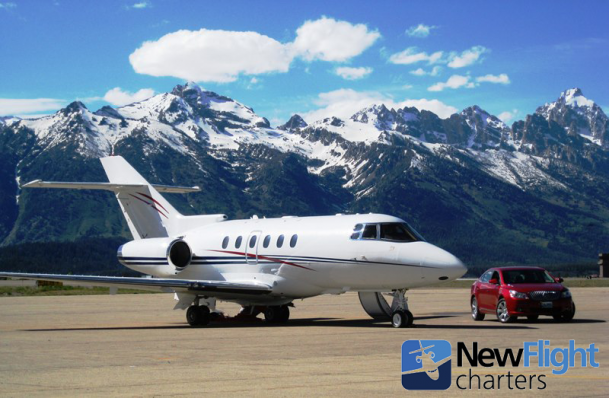 Colorado private charter information and quotes for Denver, Aspen, Vail, Telluride and more can be found at Jet Charter Colorado. For private jet charter information to and from Jackson Hole, Wyoming, see Jackson Hole Jet Charter. The nationwide jet charter aircraft listing can be found at Jet Charter Review.